Do you do craft shows? If you do then you'll appreciate where this story goes. I haven't had to do many shows over the last 20 years just because I was working a normal job and there was no time to prepare for more then two fall shows in a year. The past two weekends I worked shows, the first one I did just to participate in a town event and represent our shop. 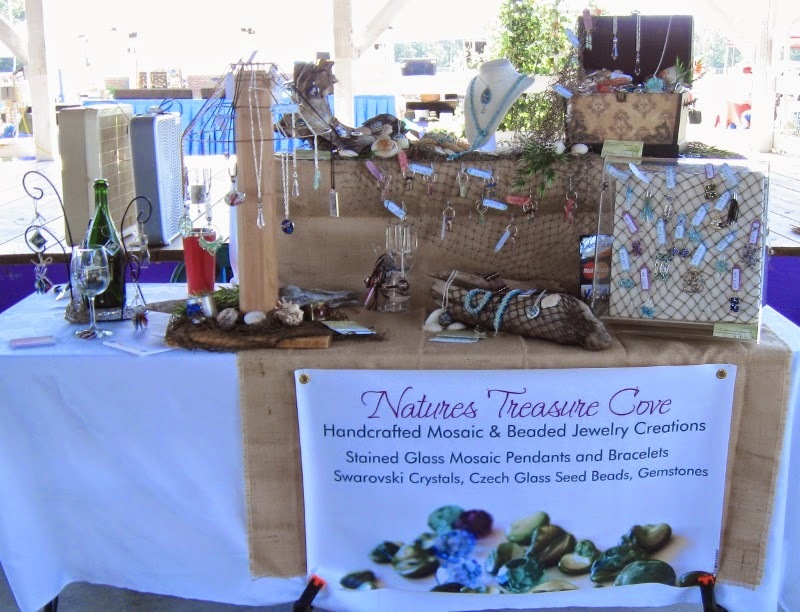 This past weekend I set up my jewelry at the annual crab festival. You know thirty years ago I could do this setting up and breaking down my display with one toe tied behind my back, but now this is like work if you know what I mean. I have to admit it I love doing shows, I equate it to the thrill of the hunt or the catch. Ladies it's just like your husbands who get up at 3:00 am to go deer hunting or fishing. They will start preparing months before the fishing trip and crafters are no different, good grief we find a show and decide that we are going to fill out the contract and do that show. Then we will work on our craft every day getting a little done here and a little done there. Then all of a sudden you look at the calendar and OMG the show is three days away, you panic and rush to take stock of what you have made so far. Well shucks, that's not enough to fill up a table and make a descent looking display. So now this usually means a trip to the nearest craft store, and your off. Once you've stocked your supplies and bought half of the craft store, yes just like the guys that go to the nearest tackle store to buy more fishing line, reels, gear and whatever else they need to go fishing. Now you settle in to work on making enough product to sell at least one item to every man , woman and child in the county. The hours are slipping away so fast, before you know it it's 2:00 am and you haven't even thought about going to bed yet. But you have to take a break, so you go lay down and pass out, this crafting stuff is hard work. The next few days go by in a blur and finally you have made all that you could possibly make in such a short time span. Now it's midnight the night before the show and you have to load your vehicle to be ready to go no later than 7:00 am to get to the show venue. You're already so tired you can't see straight but the caffeine and adrenalin kick in I guess, you manage to unload a dozen or so large heavy boxes of your crafts and set up all of it on as many tables as you can cram in your space, all of this is done by 10:00 am and now here's where the fishing analogy comes into play. You set there and wait for them, you pace the floor looking at the clock thinking this show is over at 3:00 where are the people. Finally here come a few ladies and they stop at your booth and look at what you have to sell and compliment your work but no nibbles, they move on. Well look up here come more people and the next thing you know you have cast your lines and your reeling them in and bagging your product and taking their money and taking orders and before you know it it's 1:30 in the afternoon and there are no more people, where did they go? Don't give up there might be a few more folks stopping by, at least you hope so because now your so stinking tired and sleepy all you want to do is go home and fall into your comfy bed and sleep for days. But you still have to pack all of this stuff that's left over load it back into your vehicle and make the trek back home and unload it back into the house. Are we having fun yet? If you've ever done craft shows you know this is true and for those that have never done a show now you have a whole new respect for what goes on behind the scenes and you might wonder how could anyone like doing that, it's hard work. From someone who has done it for many years I'm a lot more organised then I used to be, the check list is my friend and I don't pack a dozen large heavy boxes anymore. I think it takes a special kind of crazy to do this several times a year, I think that's why crafters always seem to get along so well because we've all been there, but we get smarter after years of doing this and it's not so bad. Pictured below is my setup at the Leonardtown Crab Festival last Saturday. If your out in your neighborhood and see a sign for a craft show take some time to check out the show and hopefully you'll find something you just have to have and make all that work worth while for the artist or crafter.